So when I’m craving a cool summer sipper that won’t take all day at the gym to work off, I turn to my favorite healthy summer drink recipes instead. The slushie I would have bought at a convenience store or the chocolate milkshake at a fast-food joint all have equally crave-worthy alternatives I can make at home for a lot fewer calories. And I’ve discovered some better options for my waistline I can order when I’m out. Here are four summer diet-busting drinks and their better-for-you alternatives for both on-the-go and at home. By making your own versions at home, you’ll save a whopping 1,464 calories versus choosing these diet-busting fast-food sippers. Diet-Busting Drink: McDonald’s Chocolate McCafe Shake (15.8 oz. ), 880 calories, 24 grams fat. Better Option to Make at Home: Double-Chocolate Malted Shake. 1 1/2 cups has 224 calories and 9 grams fat, plus calcium (18% daily value). Total Savings vs. Diet-Busting Drink: 656 calories and 15 grams of fat. Diet-Busting Drink: 7-Eleven Dr. Pepper Slurpee (8 oz. ), 120 calories, 33 grams sugar. Better Option to Make at Home: Watermelon Slush. 1 cup has 48 calories and 10 grams sugar, plus vitamins A and C, and potassium. Total Savings vs. Diet-Busting Drink: 72 calories and 22 grams sugar. Diet-Busting Drink: Starbucks Java Chip Frappuccino Grande size (16 oz. ), 440 calories, 18 grams fat. Better Option to Make at Home: Greek Iced Coffee. One cup has 57 calories, 1 gram fat, plus antioxidants, a little boost of calcium and protein. Total Savings vs. Diet-Busting Drink: 383 calories and 17 grams of fat. Better Option to Make at Home: Wake-Up Smoothie. 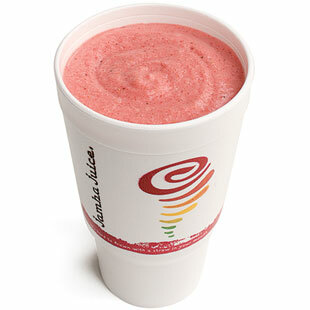 One cup has 157 calories, packs two servings of fruit, plus soy protein, fiber and vitamin C (110% dv).